With today's high-tech burglars, you need to have a high-tech means of defense. 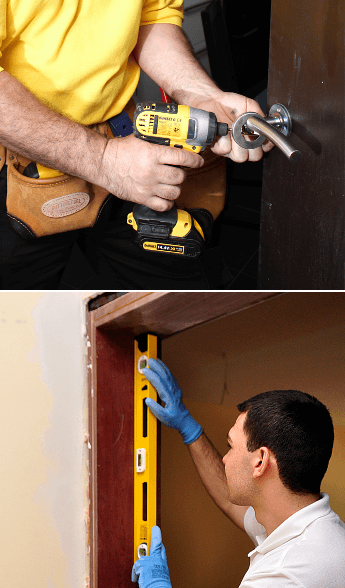 Fantastic Handyman can help you outfit any property, be it a two-storey house or a high-rise apartment building, with the latest door entry systems on the market. Our company has access to a wide variety of gadgets that will make even the most seasoned thieves think twice before breaking into your home. From simple intercoms and door phones to complicated audio and video door entry systems, the experienced crew can install everything you need to turn your domain into an impregnable fortress. Every device that the skilled and tidy technicians install will be carefully chosen to meet the individual needs of your property. If you wish to keep property damage to a minimum, the professionals can also place vandal resistant panels and top-end card entry systems. And in case you need those repaired, the team will grab their trusty tool boxes and swiftly fix the issue. Whatever your home needs, we can help you meet them. Reputable and with more than half a decade of experience, Fantastic Handyman is a company whose main goal is to help people get one step closer to “the perfect home”. From performing small odd jobs, helping you mount your brand new plasma TV, doing electrical work, or installing modern door entry systems, the experts will do what it takes to improve the comfort and security of your dwelling. You don't just need a random piece of electronic equipment – you want the security system that's right for your home. And the quick and experienced specialists at Fantastic Handyman know how to achieve just that. The technicians are well-versed in setting-up digital and telephone door systems, IP door entry systems, and other hardware from many different manufacturers to meet your needs from start to finish. All handymen come with the proper certificates and the array of technical skills required to properly install any door security system. We also invest in their professional training to ensure that your doorway will be rung by diligent and experienced technicians who will know what they’re doing. Whether you wish to install your electronic door entry systems next week or need emergency repairs today, you can always get in touch on 020 3404 4045. You can also reach us online by submitting our online contact form or via using our real-time chat. Our friendly and knowledgeable advisers will then reply you at a moment's notice to answer all your questions and provide you with a personalised quote. A few clicks on our website is all it takes to hire a seasoned expert who will install your apartment door entry systems. Alternatively, you can download our GoFantastic app to access this and many other handy home and commercial services on the fly!